Whether it is career growth or new opportunities, Hospitality industry is always ahead and full of opportunities. Growing population and their desire to gain pleasure experience in segment like travel, tourism, event, luxury brands etc. are creating new roles & opportunities every day in the world of hospitality. In no time, the hospitality industry has experienced immense growth and expansion and holds great potential for future growth. With such dynamic statistics, the industry is grabbing attention of youth to make a bright future in this industry. But before starting off in the hospitality industry, there are certain skills and education, which are compulsorily required by this industry. To gain the quality skill set and knowledge required by the industry, one should look forward to top institute or college of hotel management in the country. 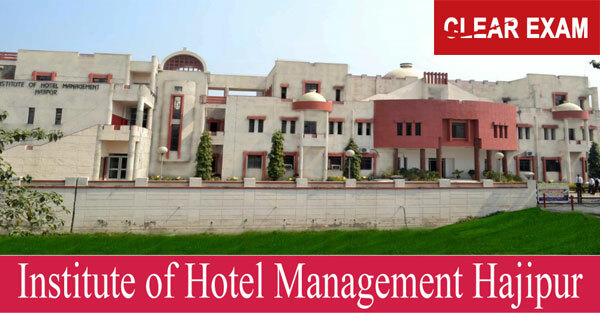 One such great example of top hotel management institute is Institute of Hotel Management, Hajipur, which is counted amongst the 21 IHMs of India. Admission to Bachelor of Science in Hospitality and Hotel Administration course is done through NCHM JEE conducted by NCHMCT, which is affiliated to Ministry of Tourism, Government of India. The application form for the exam is available from December to April. Students applying for the exam are required to fill the form and paste their passport size photograph on the space provided in the form. The form need to be sent by registered post/speed post at NCHMCT Noida office. The admit card is available online only and need to be carried by student to sit for the exam. The pattern of exam is Multiple Choice Questions (MCQ) with 200 questions carrying 1 mark each. The result is being announced in the 3rd week of May by NCHMCT. Students are then allotted the seats in college based on their ranks in the exam. Further NCHM Counselling is also done for the students. Facilities by IHM, Hajipur Students are provided with well-equipped kitchen. Institute provides Basic Training kitchen for initial knowledge about cookery, Quantity Training Kitchen for the second year students to learn and prepare foods as per industrial standards and Advanced Training kitchen to final year students for final brushing up before going in different positions at various levels in hotel industry. It also provides well- equipped computer labs and library to its students. Further hostel facility is also available for boys and girls separately. Apart from this, students can get all the information regarding fees, courses, syllabus etc. at IHM, Hajipur Further details about other things regarding NCHM JEE Counselling, syllabus, books etc. can be obtained from latest article on Hotel Management at Success Mantra.